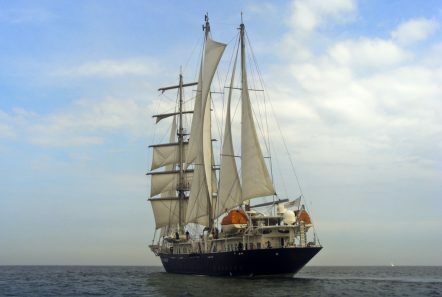 “Running on Waves” is a modern sail ship of the high ocean class, the unique technical features of which are confirmed by the US Patent Department. 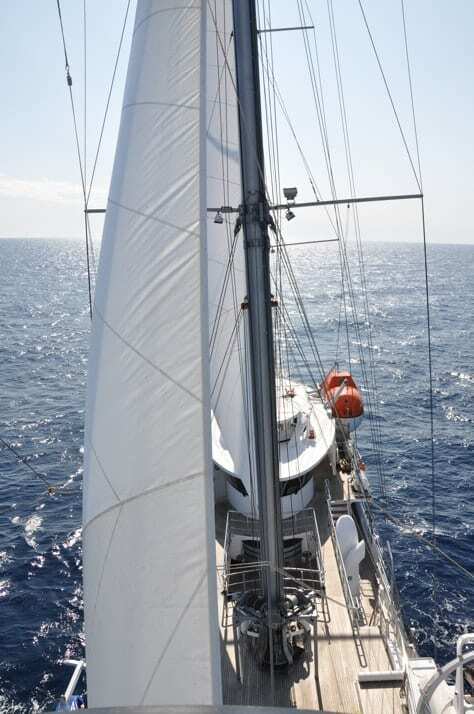 She possesses impetuous contour, full sailing equipment and high-performance engine. 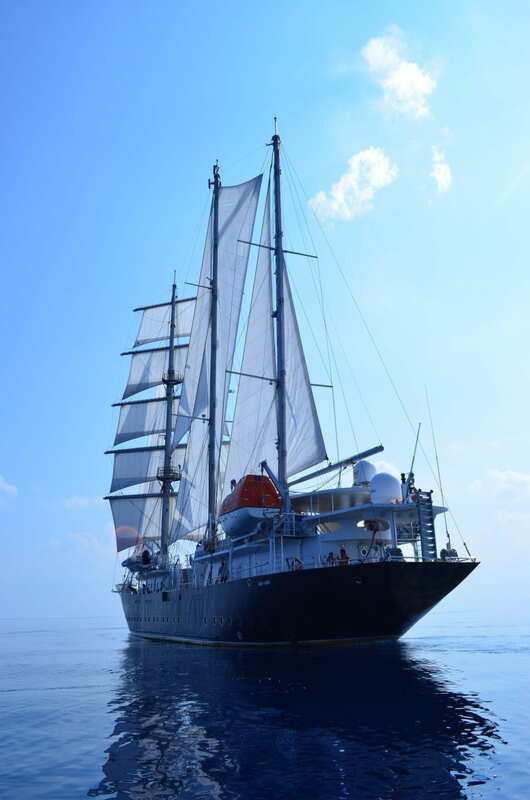 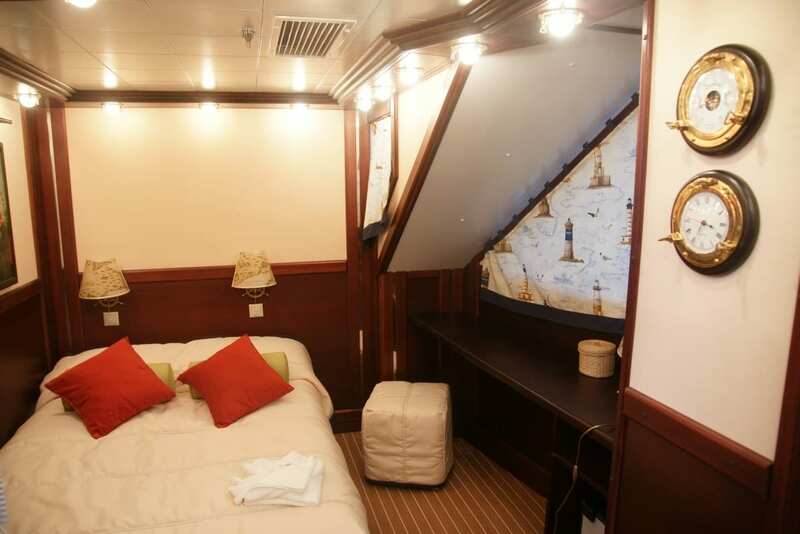 It is a real cruise sailing ship of high ocean-going class +100 A5, modern and environmentally compatible. 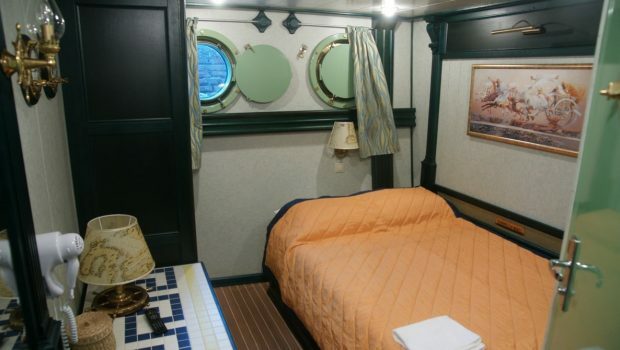 The ship’s draft is not larger than one of a middle-size yacht. 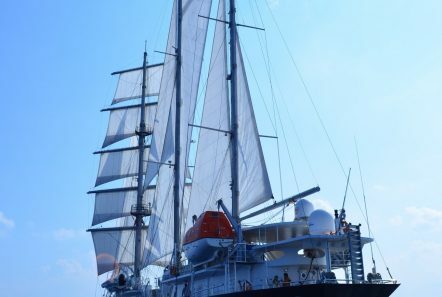 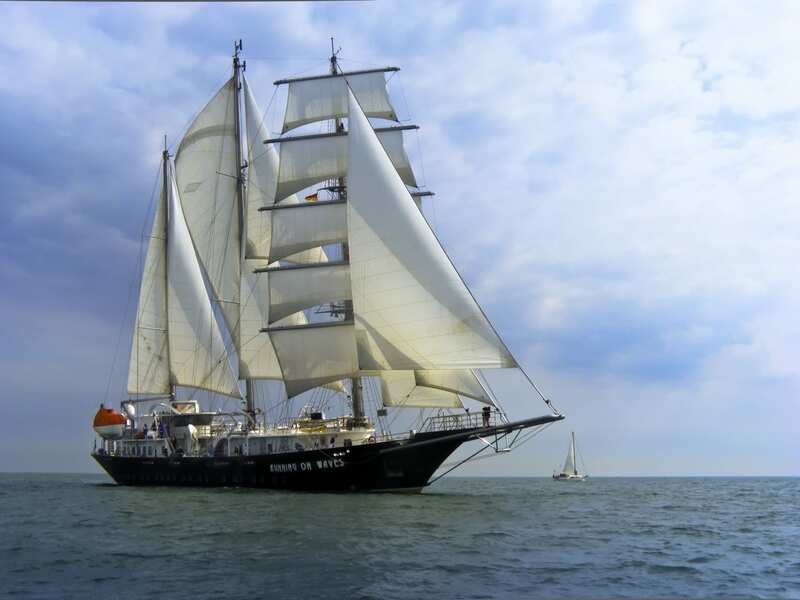 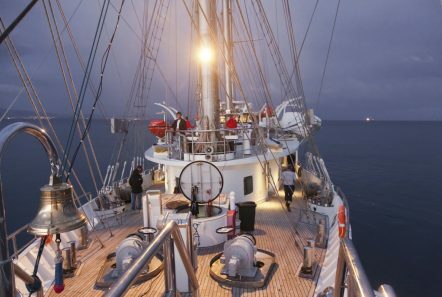 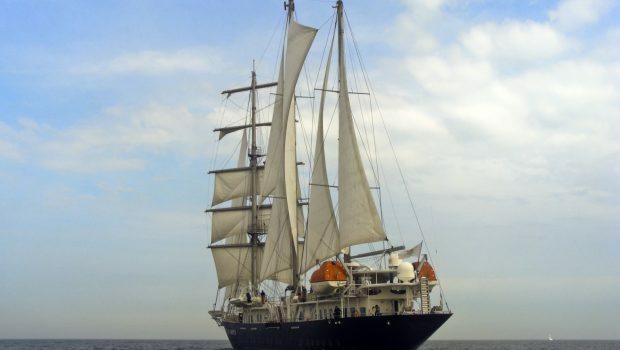 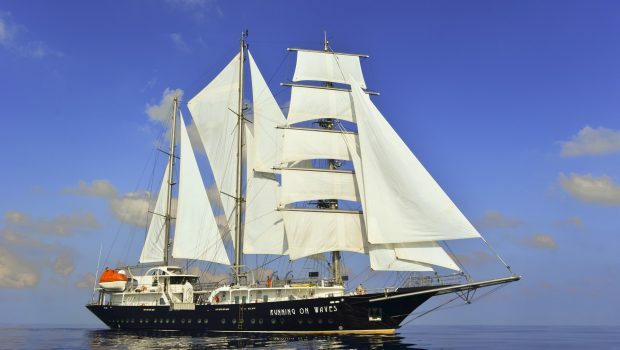 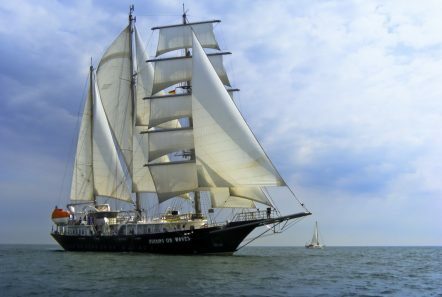 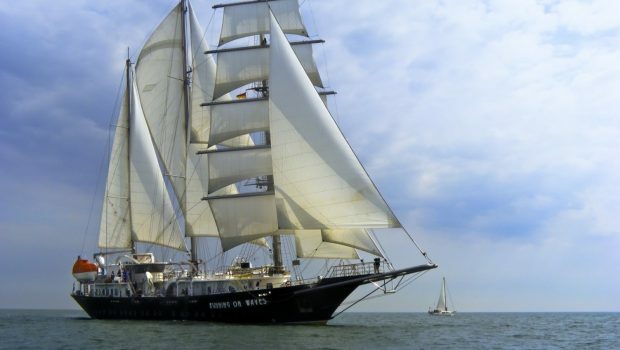 “Running on Waves” is a sailing ship of the 21st century. 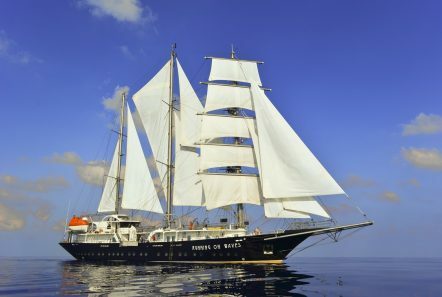 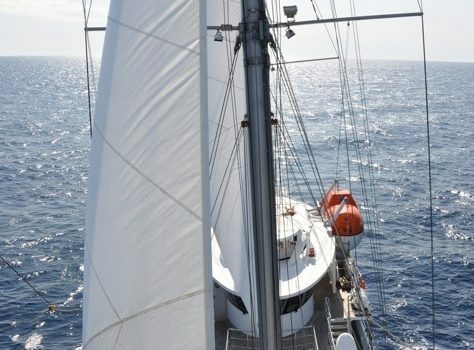 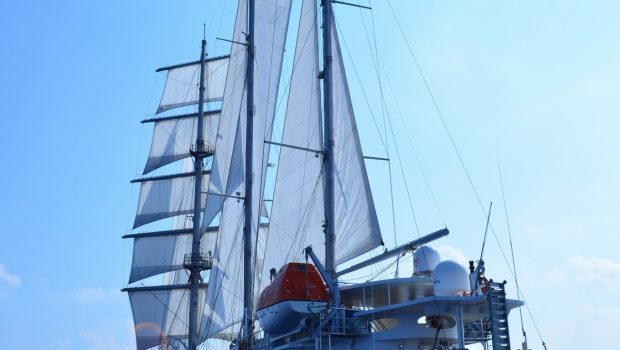 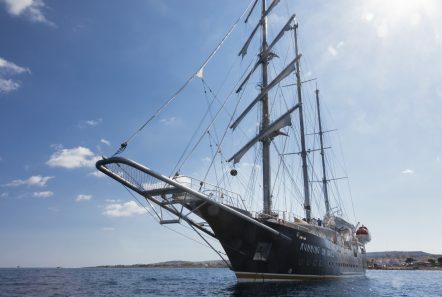 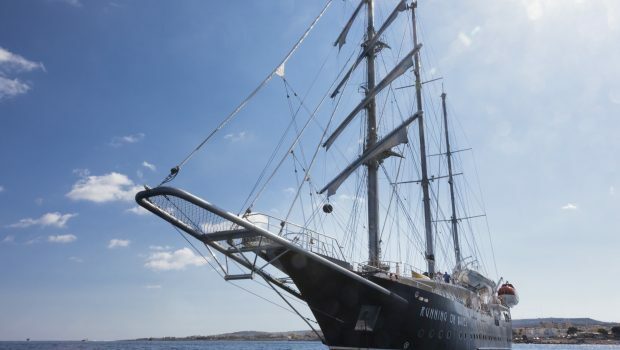 She combines forms of a classic clipper with modern rhythms of design engineering, however her lines do not permit her to become a high-tech article. 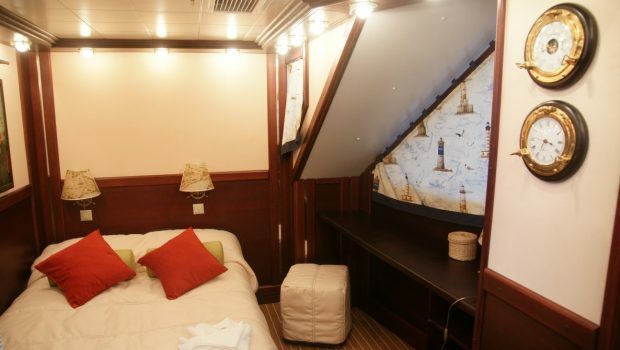 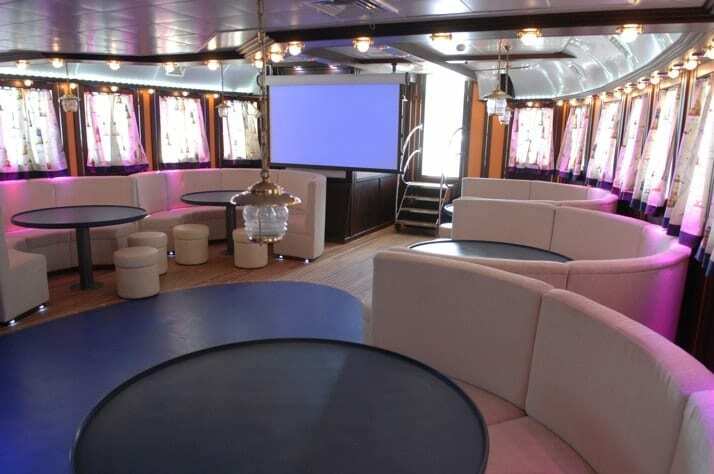 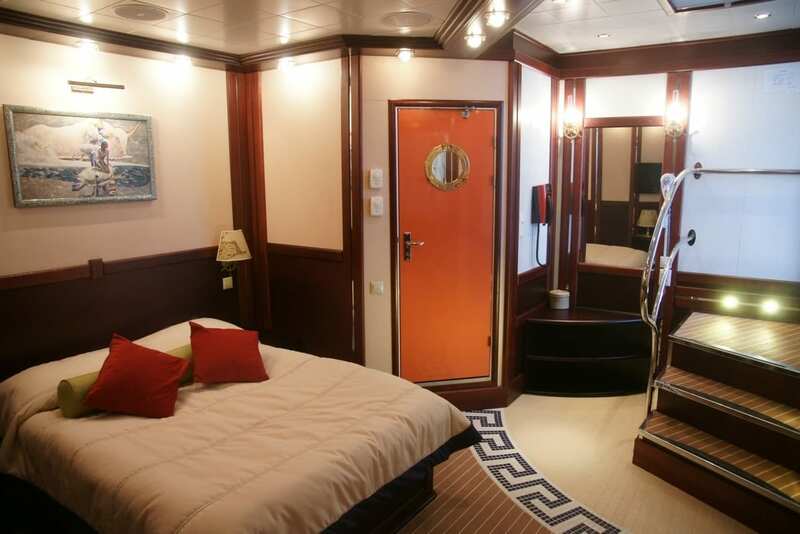 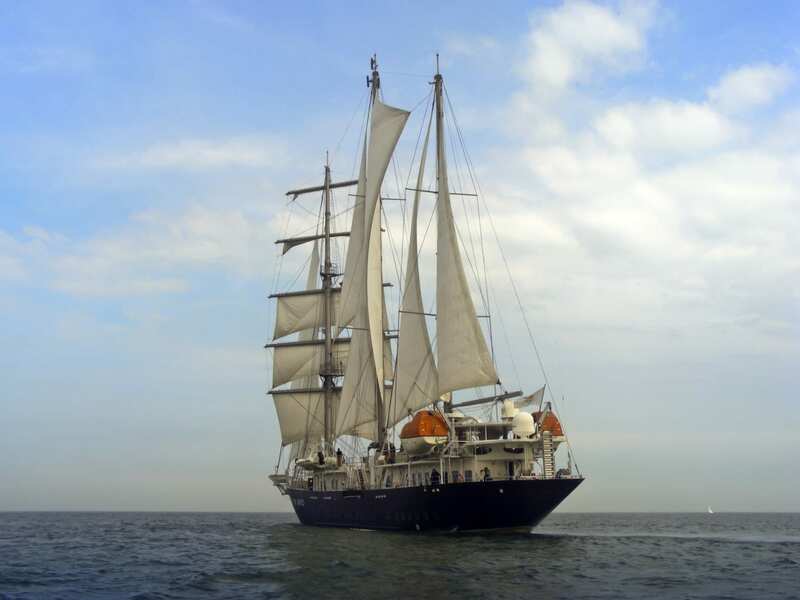 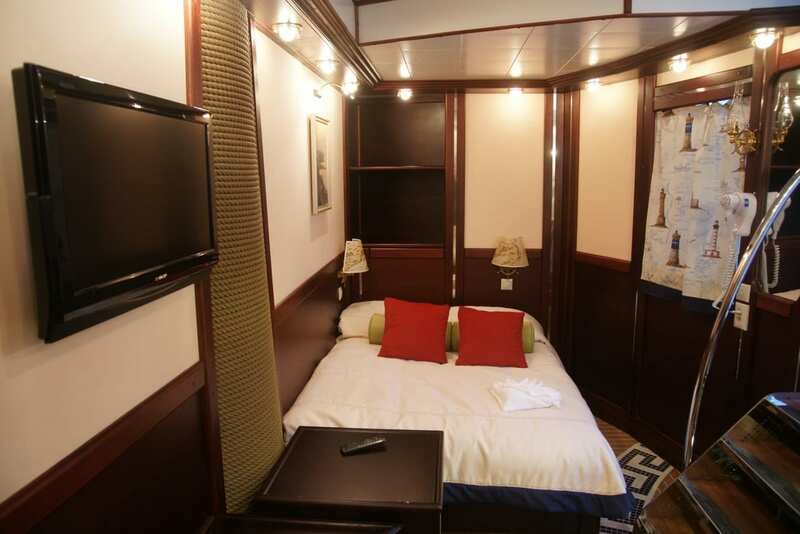 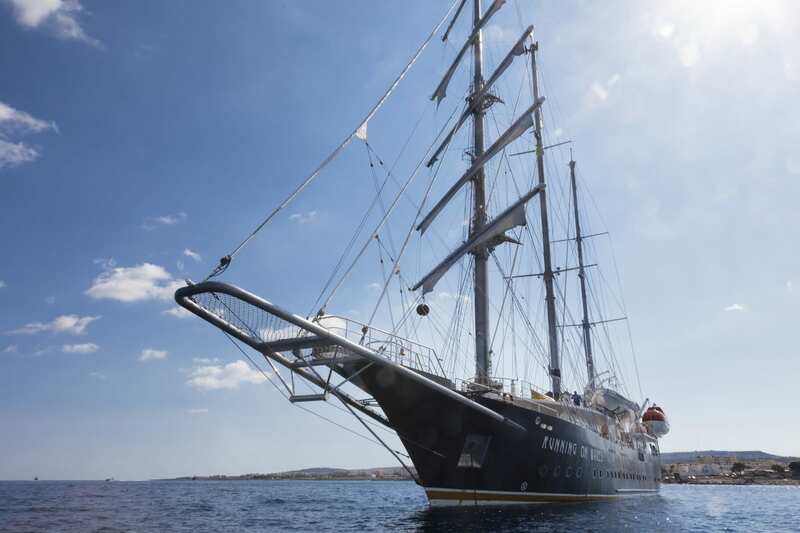 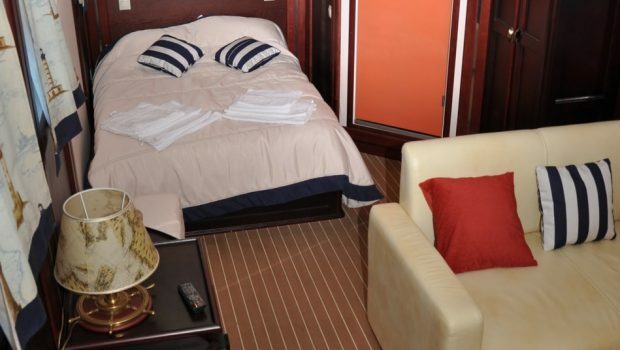 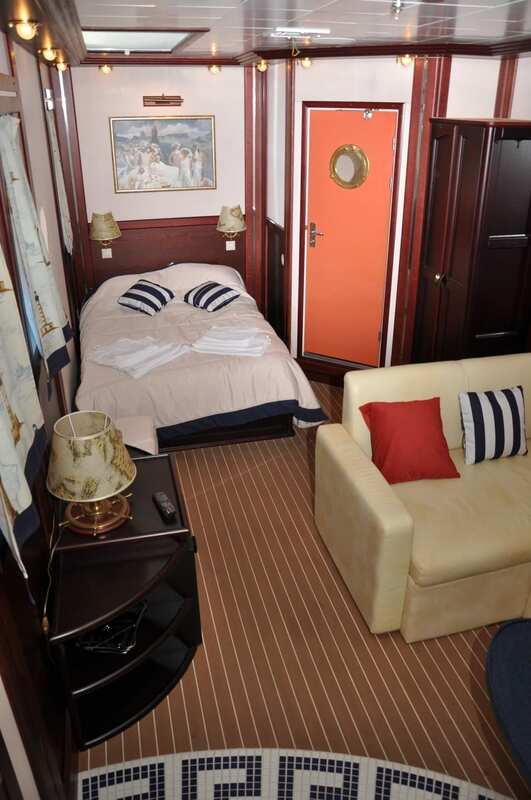 Significant dimensions of the ship (length 64 meters and width 9 meters) accommodate up to 42 passengers in 18 cabins. 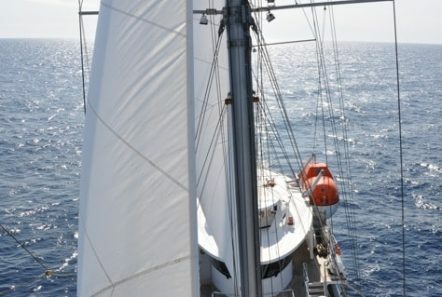 Such size is ideal for a voyage where one may want to both be left alone and be part of a group. Besides more generous cabin sizes, every passenger here enjoys three times more of the available open teakwood deck space than on ships of similar category. 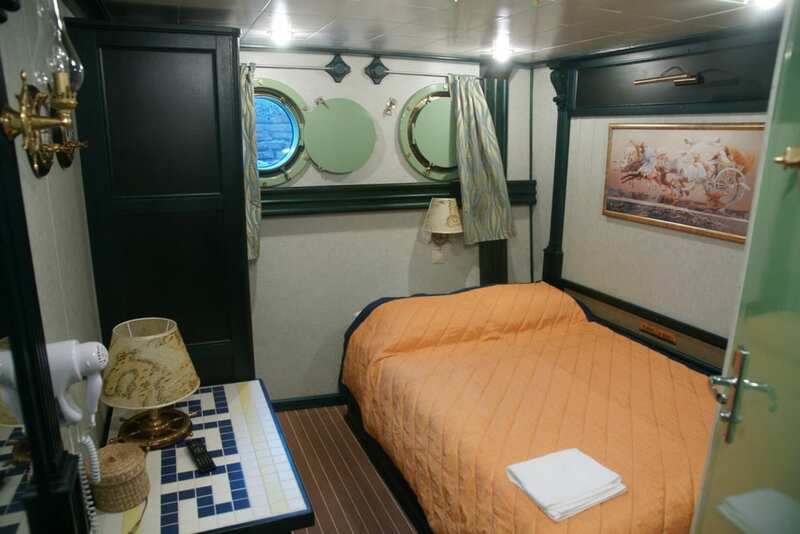 The ship has vast space of shaded areas, creating spacious shade zones on open decks. 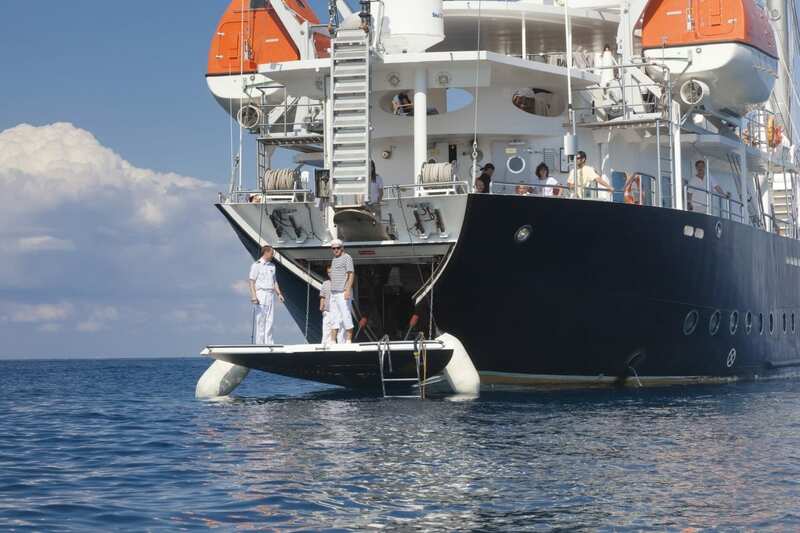 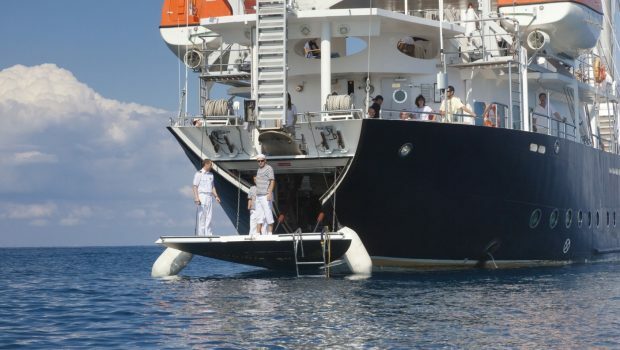 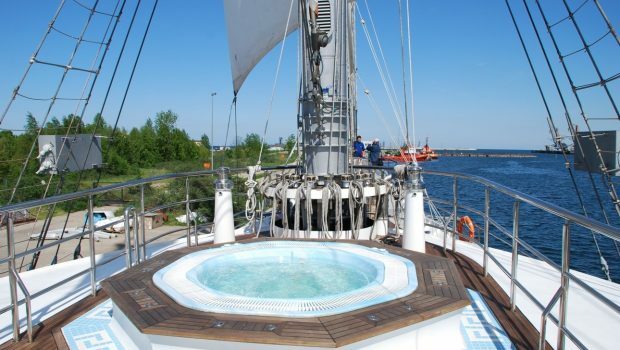 A fresh water three-meter deep Jacuzzi-swimming pool is located in the fore of the ship. 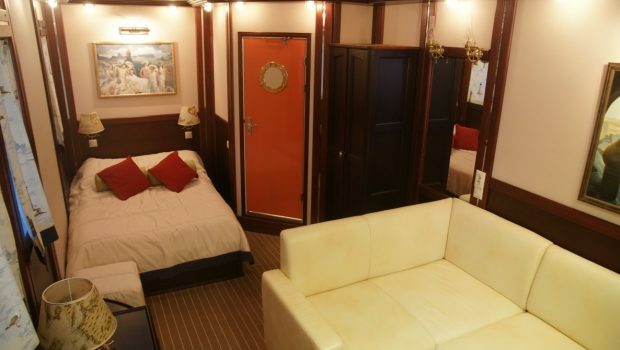 Accommodates 6 people. In the aft of the ship, navigation equipment is behind the command bridge, followed by the massage center and the lounge zone. 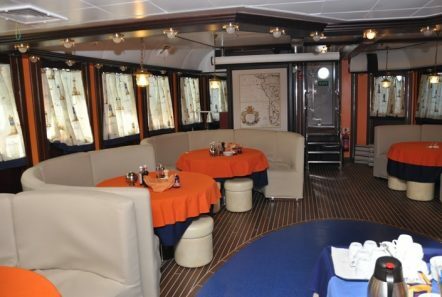 A tour of the command bridge can be arranged at passenger’s request. 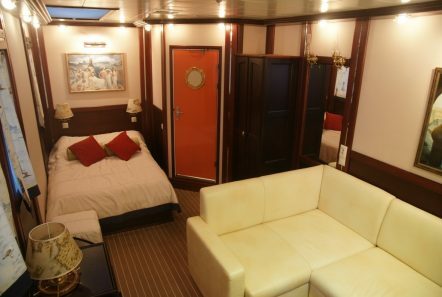 Then one may enjoy professional massage services in the massage parlor, followed by some downtime on a small sofa in the lounge area. 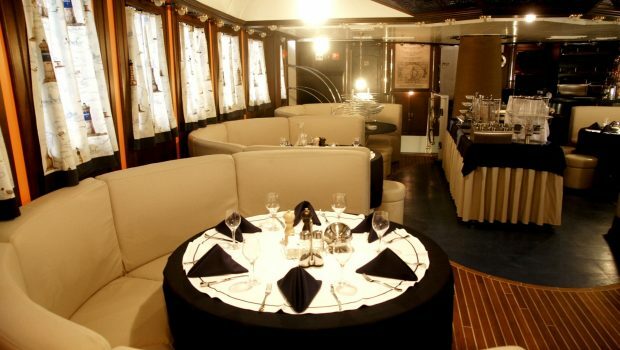 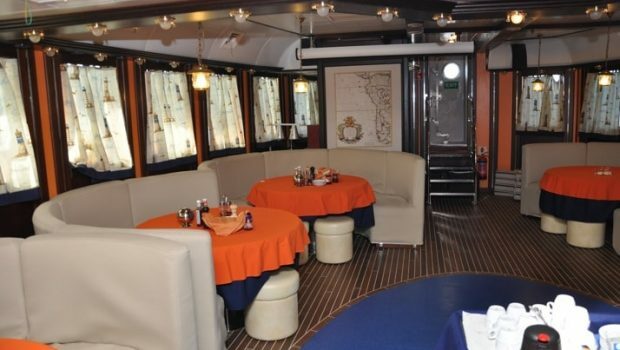 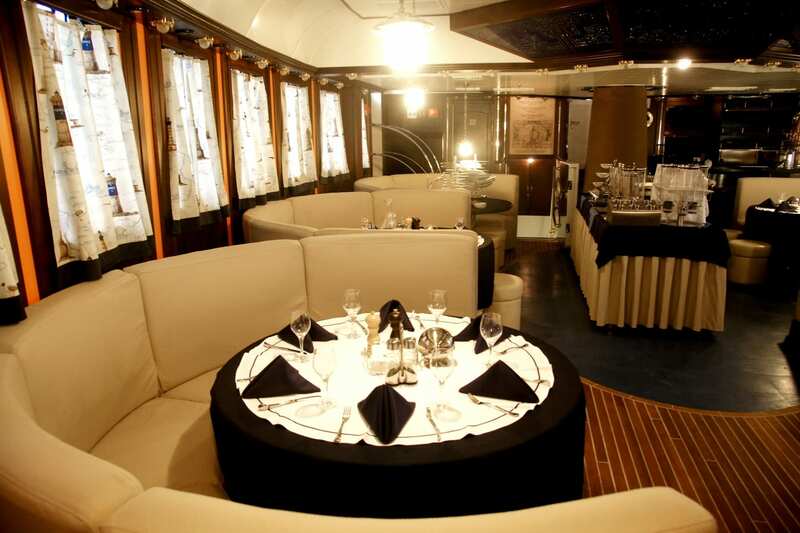 The restaurant located on the Main deck is ready to please the ship’s guests with delicacies of Mediterranean cuisine. 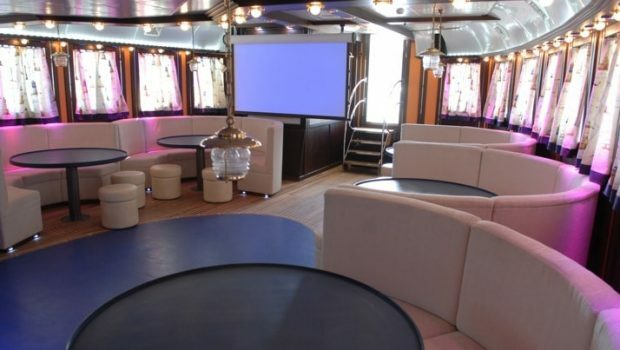 A Fantastic Ocean Bar, located in front of the restaurant in the central part of the deck, offers refreshing drinks and stunning cocktails. 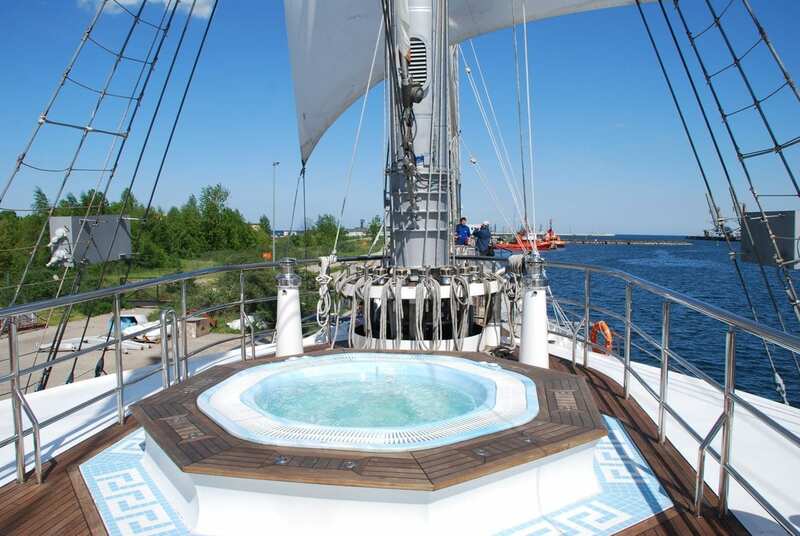 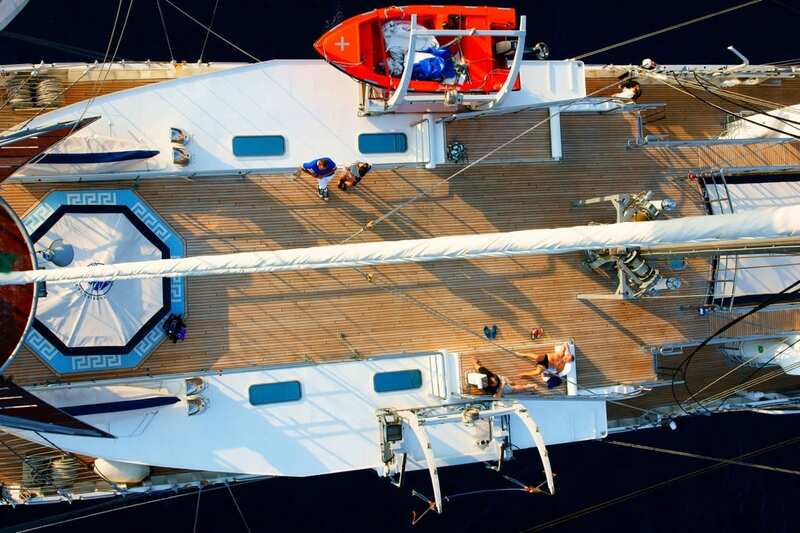 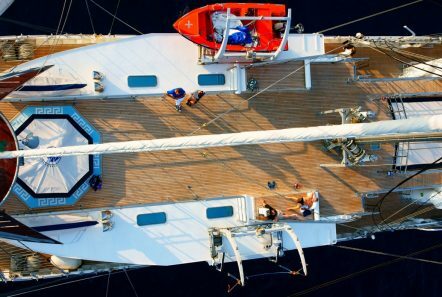 An observation deck in the fore of the ship is above the bowsprit, creating a feeling of flying over the water! 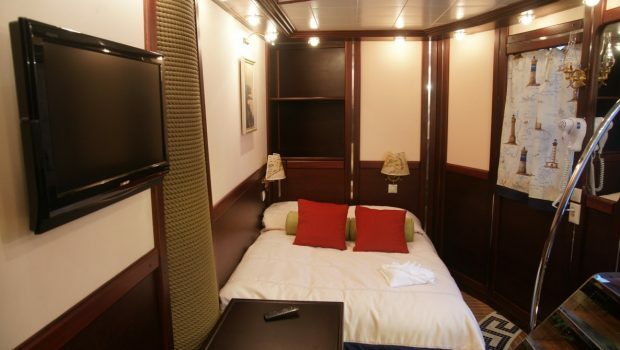 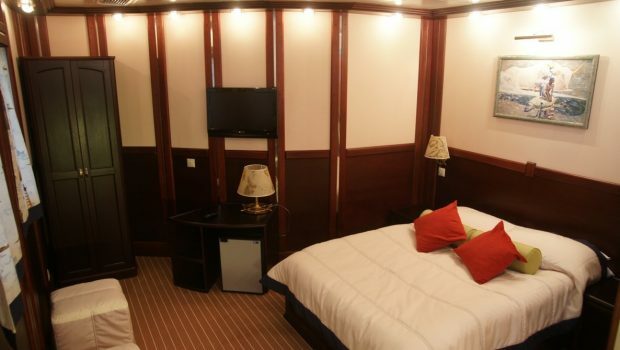 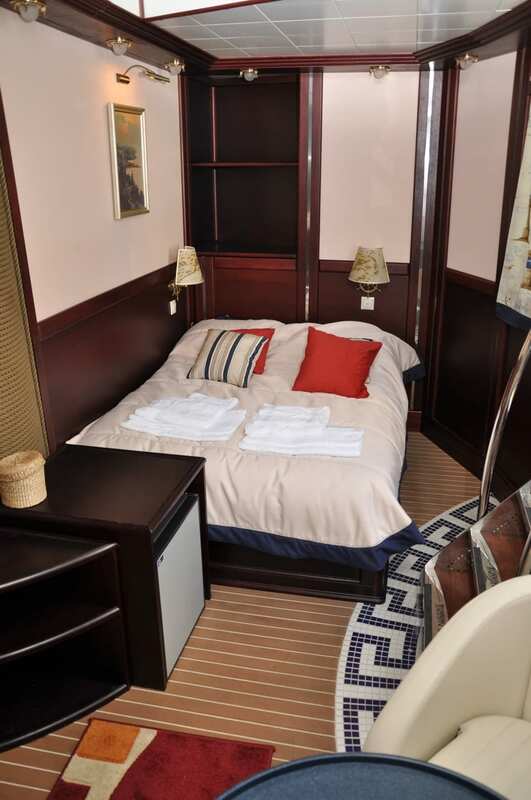 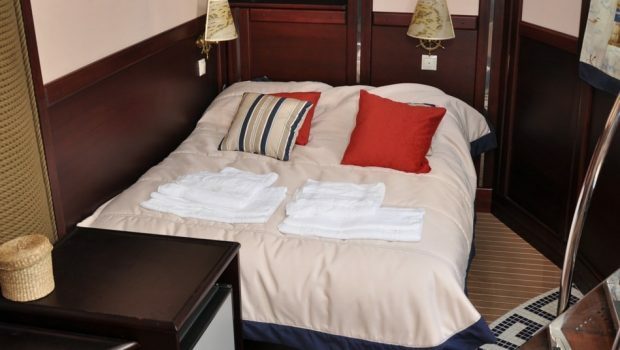 There are three categories of cabins: Mini-suites and Premium Class Cabins; Standard Cabins; Economy Class Cabins. 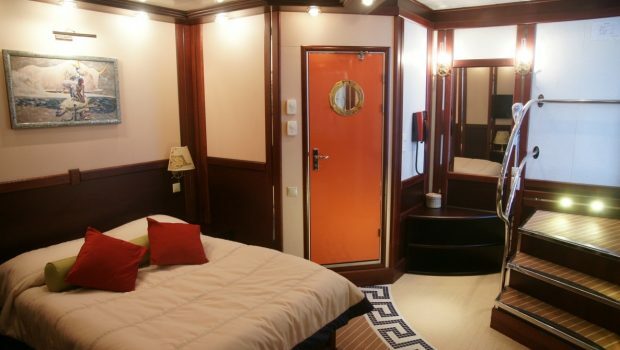 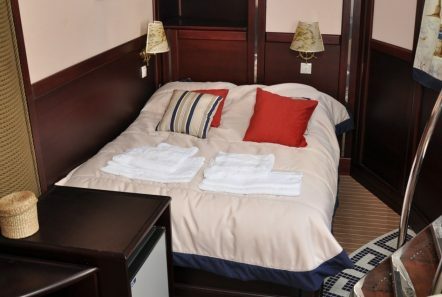 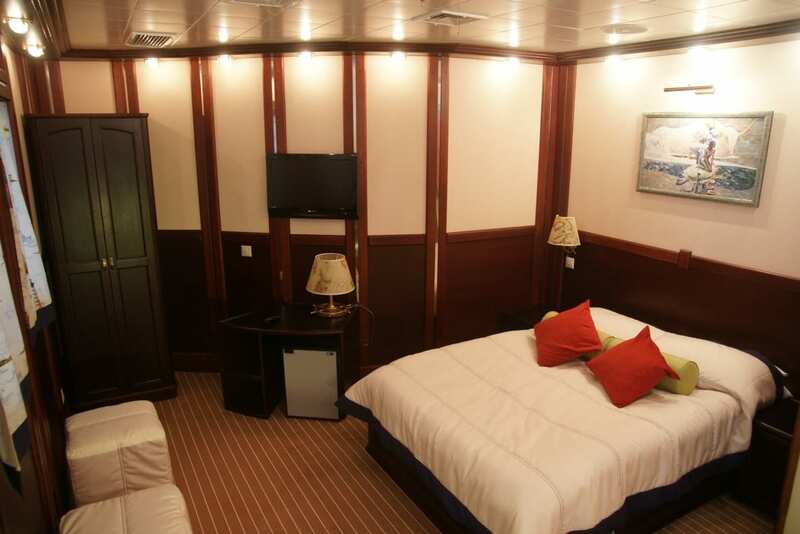 All cabins are fitted with air conditioners and heating, transmission from underwater and over-water cameras, as well as data from navigation devices are broadcast from the conning room to the multi-function TV monitors in the cabins. 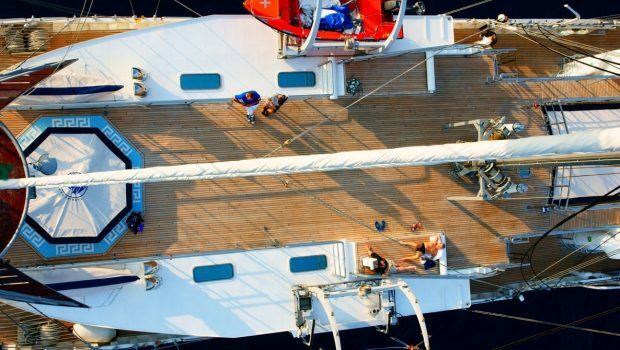 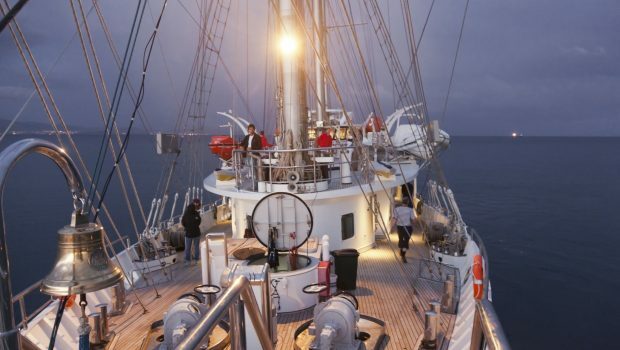 An optimally crafted itinerary masterfully combines trips at sea, events on board and excursions on land.